Codicote were awarded another penalty in the second half but by then Adam Furness whom had scored the two in the first half had been subbed so it was left to Leeroy Williams to take it. The kick was well saved by the Cranfield keeper. Kane Dougherty got Codicote's other goals who was playing for Langford earlier in the pre-season. As stated the crowd at the stadium was very sparse indeed with only an handful of people present. Codicote's home at the John Clements Memorial Ground in the village is not deemed suitable for this level of football hence why the club share a few miles down the road with Hatfield Town. If you do live in the area I highly recommend a visit to watch Codicote play as it's only £4 to get in with a free programme and the nice touch of a free cup of tea thrown in which is a tremendous value. 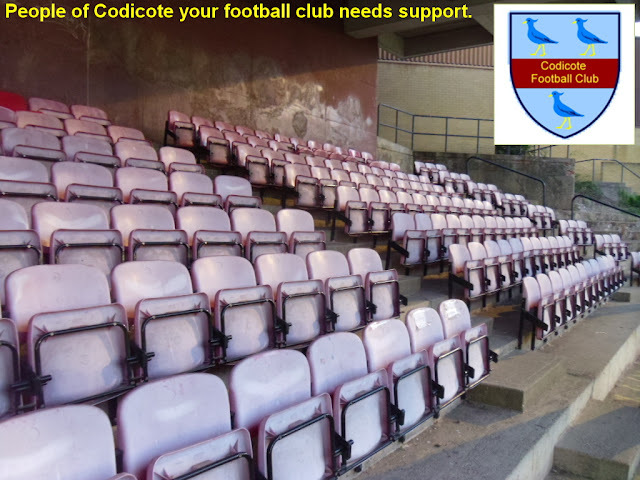 People of Codicote your teams needs some supporters!! Why not pop along for the FA Vase local derby game against Wodson Park this Saturday? ?